Pump and Abrasion Technologies® (PAT) unveiled its new CURVE™ range of pumps in September 2016. 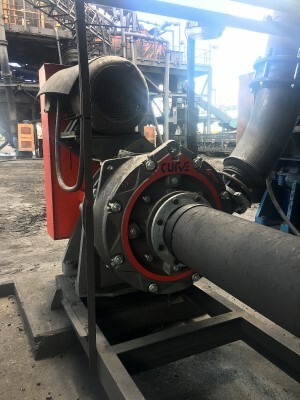 A prominent South African ferrochrome processing plant was among the first companies to adopt this new technology by implementing a project to change all their pumps to the CURVE range of pumps. The conversion project commenced with the installation of the first CURVE™ pump on 1 November 2016. Since then, this pump’s performance has surpassed all expectations while being closely monitored to validate the actual performance of CURVE™ pumps in real-world applications and conditions. The CURVE™ S150 model offers several innovative features that makes it an ideal candidate to meet the client’s operational needs. These features include a one piece volute liner, fully profiled impeller vanes, adjustable throatbush, enhanced cutwater profile, and a clip-in suction joint. Sealing performance and life have been addressed by a larger diameter expeller and high chrome shaft sleeve and lantern ring. The CURVE™ S150 also features a discharge piece designed to eliminate the need to remove the discharge pipe during routine maintenance. PAT has been monitoring the performance of the first pumps installed at the client’s plant on an on-going basis and the results underline the CURVE’s™ incredible operational capabilities. “One of the most astounding results we have seen so far is a 73% reduction in downtime. The pump is only opened every third maintenance cycle due to its longer wear life. This was measured in comparison to the wear life and required maintenance of the previously installed pumps,” says Pienaar. Along with this, maintenance on the pump was reported as being easier and faster compared to experiences with previous pumps. This is due to the inherent features of pumps in the CURVE™ range. For instance - the pump’s encapsulated one-piece volute liner reduces opening and closing time by 80%; eye bolts allow for safe removal of the casing; the casing assembly is a balanced load for safe handling, and the discharge pipe no longer needs to be removed when disassembling the pump thanks to the newly designed discharge piece. Additional benefits that the client reported with this pump includes quick and easy dismantling, inspection and reassembly; improved safety when working on the pump; excellent sealing over the trial period; and essentially choke-free operation. An astounding 52% reduction in total ownership cost was reported with a number of factors contributing to the reduction. Firstly, the pump’s adjustable suction liner maintains optimal clearances thereby reducing wear and improving efficiency. Then there is the one piece volute liner that improves the liner wear life from 10 weeks to 30 weeks. An assessment of the pump also revealed that the CURVE™ pump impeller at 15 weeks had visibly reduced wear compared to the previously installed pump at just 5 weeks. 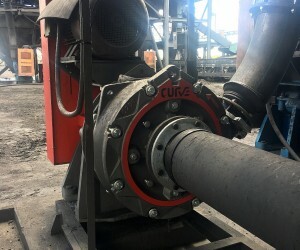 “The application at the client’s plant is a perfect example of what the CURVE™ range of pumps is able to do for a mine. Now there is concrete evidence that this pump is the best solution for any mine or minerals processing operation. The facts are there to prove that the CURVE™ slurry pumps save real money,” Pienaar concludes. During the first quarter of 2017, PAT was awarded their first all CURVE™ pump project. The project in a new technology flotation application, included the supply of 13x S150 CURVE™ pumps inclusive of motors and drives. The project was initially proposed late 2016 and the order was placed in February 2017 with delivery in March 2017. What makes this project significant is that the wear life of the pumps had to be guaranteed for a fixed period as part of the client’s operation methodology. This obviously made the CURVE™ an ideal candidate due to its high emphasis on total ownership cost reduction and service cycles.